Strange, most of my 2019 GIS notebook is indecipherable scribbles on a cocktail napkin from The Hard Rock Hotel. 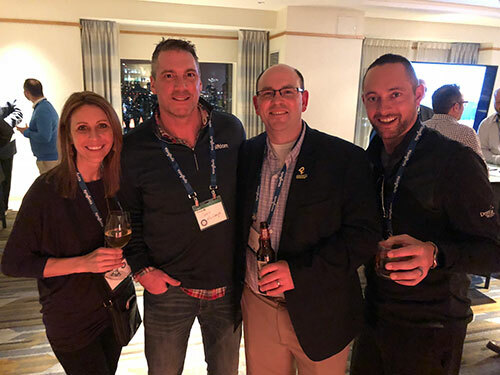 GIS 2019 was another great event for the entire Golfdom team. It’s a treat to go to an event and feel like you’ve got an open-door welcome at every single event being hosted in the city. 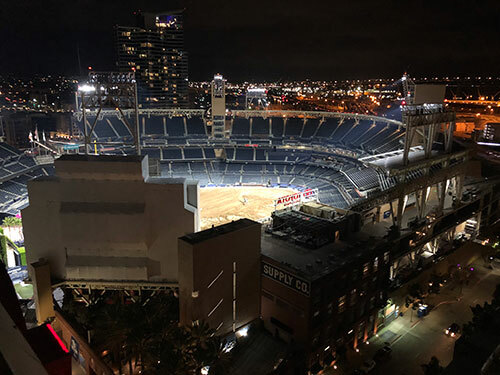 Consider this: I changed my travel plans and arrived a day earlier than normal in order to attend the Syngenta Business Institute 10-year anniversary party at the top of the Hilton Bayfront. It was the one thing on my agenda on Monday. I felt a tinge of self-doubt as I got off the elevator… was it wise of me to change travel plans for one event? After about two blocks of this, and watching Craig steadily widen his gap in front of me, I decided I had enough of the scooter for one day. Thankfully Rob Wagner, Trump National Bedminster, saw me from his lunch spot and hollered at me. Now I had an excuse to ditch the scooter and get back on solid ground. Next thing I know I’m hanging with the Jersey boys (but where was Russ Harris? ), sharing some laughs and hearing some stories. 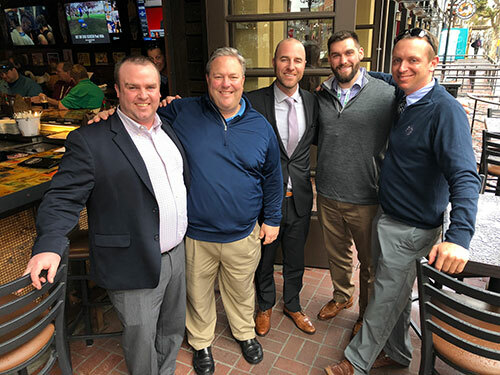 I got to meet Todd Raisch, CGCS at the Ridgewood CC in Paramus, N.J. All of them were kind enough to act like they didn’t see me wobble by on that scooter. New Jersey guys know how to keep a secret. The scooters weren’t all bad. 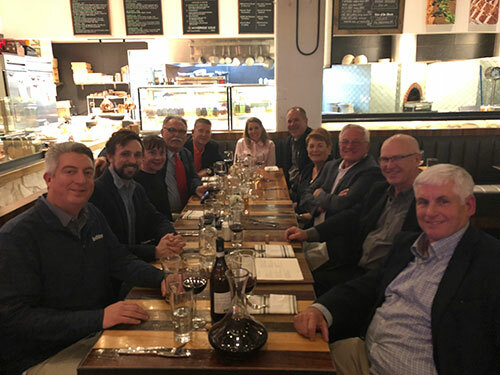 I did enjoy the long ride on the boardwalk, hustling from the Simplot customer event at Fox Sports Grill in the Hilton Bayfront to the DryJect party at the Harbor House. There were five of us together at that point, all on scooters, zipping by the old folks on foot. I was still nervous about wrecking, but I had to laugh as CEO Kevin Stoltman shouted out, “This is so cool!” as we zipped along. San Diego has great party locations. Nufarm’s party at Tin Roof was a great location, large, with an upper deck good for viewing the band. The PBI-Gordon party at Union was a cool spot with a great selection of microbrews (and their own limited edition Pedigree Lager, commemorating the first liquid flutolanil formulation… at least that’s what it looks like it says on my cocktail napkin). My team raved about the Koch party at Rustic Root. 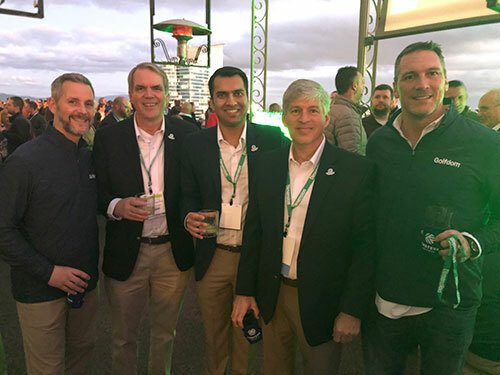 And I’m biased, but I enjoyed the Irish pub where we hosted the Golfdom party, the Field. Oh yeah! Sorry about that. You know me. 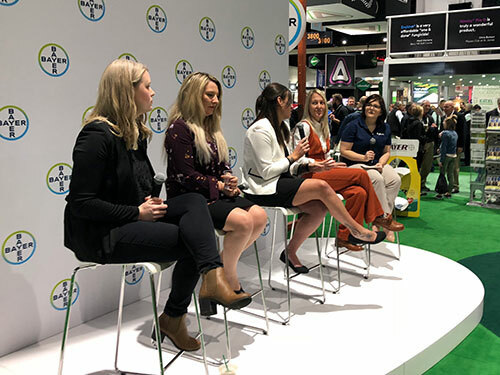 First, two honors for the magazine: Golfdom was invited to host two panels; “Women in Golf,” at the Bayer booth (learn more about the panel discussion in Abby Hart’s GIS recap). Our own Bethany Chambers moderated the panel and did an excellent job (and thank you for the shout-out, Bethany! ); And I was asked to moderate Anuvia’s “Legends Initiative” which honored Ted Horton, CGCS. Matt Shaffer, CGCS and Bob Farren, CGCS, were also guests of the panel. Again, I’m saving the very best stuff for the magazine, including the above two panels. We’ll have more in the March issue of Golfdom on both, and thanks to our friends at Anuvia, soon you’ll be able to watch the whole panel and hear Ted’s amazing story about working for the King of Morocco. I got to talk grass with my old friend Rodney Lingle, CGCS. 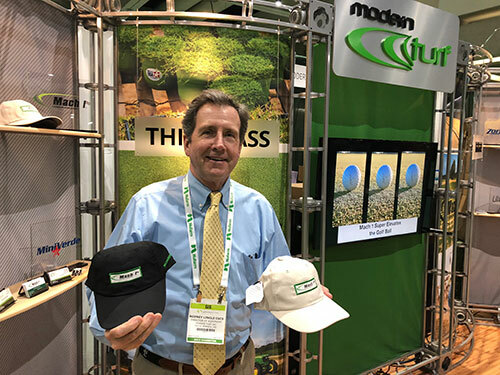 He was at the Modern Turf Inc., booth, celebrating the launch of Mach 1 Ultradwarf Bermudagrass. This grass is his baby, and Rod knows his bermudagrass. He’s been studying and growing this grass for 20 years and now he’s ready to share it with courses looking for a premium stand of turf. Rod tells me the grass has a great response to PGRs, it’s dark green and provides a superior putting surface. His photos have me believing, I’m looking forward to putting on this grass soon. Seeing is believing and I was impressed with how the researchers at Bayer are showing off the benefits of Stressgard. Chenxi Zhang, Ph.D., and Paul Giordano, Ph.D., did a useful demonstration of what was on display at the Bayer booth, showing off the roots of a few sample cores, as well as aerial photography showing treated and non-treated fairways. But it was the roots of the test plots that used Indeminfy nematicide that was most shocking… taken from a course in Texas, the root system of the cores without Indeminfy? They were all but gone. Imagine the water it took to keep those greens alive with hardly any roots in Texas! There were a lot of other visits — John Deere, Pursell Agri-Tech, Amvac, Koch, Toro, Textron Golf, The Plant Food Co., Quali-Pro, Aqua-Aid Solutions… but right now I’m blowing out my word count and my digital editor tells me it’s time to hit “send.” So I’ll come to an abrupt end now, and remind you that I’ll have more from my cocktail napkin notebook — including an exclusive sit-down with a chemical company that I think is really turning heads in the industry — both here on Golfdom.com as well as in the magazine.